Investigate the alluring mead at a Coldharbour tavern. The Everfull Flagon — Discover the terrible secret of the Everfull Flagon. Discover what is wrong at the Everfull Flagon. I came across a dead body on the path to the Everfull Flagon. The dead body clutches a note. (Optional) Talk to the patrons. Talk to Bernt the Brittle and Nelhilda. Find the Shrine of Kyne. Find Hautt's lute and Hridi's daggers. After making your way down the path past the ruined house to the only ruined building, avoiding or fighting the Scamps and Soul-Shriven (Blademasters and Invokers) you will find a body practically on the doorstep of the tavern. Inspect the body for clues. I should read the note. Reading the letter will reveal that the tavern is under some sort of enchantment involving mead and someone or someones are trapped in there. Once you finish reading, Gamirth's Final Message will appear in your inventory. The letter doesn't give a name of its intended recipient so you will have to do some mingling to find out. Enter the The Everfull Flagon and start talking to the patrons. They will appear to be in high spirits but if you ask some of them about Gamirth, you will consistently be pointed in the direction of a man called Bernt. This older man can be found sitting on a bench near the tavern's entrance. "The Everfull Flagon has the finest mead!—Don't drink the mead." "A new face! That's a rare occurrence. Welcome to the Everfull Flagon, friend!" Did you know Gamirth? I found his body and a love letter he wrote. "The Everfull Flagon has the finest mead! Don't drink the mead. Gamirth is dead? He was my daughter, Nelhilda's, mate. Her true love. I suspect the contents of that letter will break her heart—if she's sober." What did you say about the mead? "You must try our Special Blend. Do you like to celebrate? Everyone here is always celebrating something! Nelhilda and Gamirth were working to find a way to end this madness. Go upstairs and talk to Nelhilda. She has a plan." From his odd manner of speaking, there is definitely something wrong at the Everfull Flagon but this Nelhilda may have a plan, so head upstairs to speak with her. You also have an opportunity to ask him further questions. It should be noted that there are three pages from a journal which can be found on both floors of the tavern which provide hints of what happened leading up to this. Nelhilda can be found in the cordoned off bedroom section and will recognize you as someone new. She will explain the effects of the mead as well as the countermeasure she has created for it. "You're not one of the regulars here at the Flagon." Your father sent me to help you. "I can do this. I can resist the mead. For my Gamirth. Father sent you? Good, I can use the help. The mead is enchanted. It muddles our minds and clouds our memories. But I may have found a way to purify the mead and stop the cravings it inspires." "I need a rare magical flower, Kyne's Tear, to make a potion. Unfortunately, the flowers are invisible. You need a Kyne runestone to see them. There may be a runestone at the nearby abandoned shrine." Before you leave the tavern to find the needed ingredients, you can hand her husband's letter to her and ask her some additional questions. The sacred stone should reveal where the magical flowers grow. When you leave the Everfull Flagon head south towards the small shallow lake, you can either fight or avoid the scamps and Spider Daedra which hand around the lake. On the far side, there is will be an upward-sloped path—climb it to reach the Shrine. 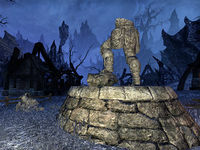 The area will be guarded by a powerful spider daedra called The Spinner of Lies, you can either sneak past her or kill her. On the altar of the shrine will sit the Runestone of Kyne, take it and the Kyne's Tear plants will become visible. Before you leave, take the opportunity to read the standing stones—Hidden Tears and Kyne's Tears. Head back down to the lake and look around and beneath the roots for the flowers, they will be red and the plant itself will be surrounded in streaks of white light. Once you have four Kyne's Tears flowers, head back to the tavern to hand the flowers over. Nelhilda will be happy that she did not imagine you earlier. "You came back. I was afraid I'd imagined our earlier discussion. My mind plays tricks on me. Especially when the craving gets really bad." I found the flowers you asked for. "I wasn't sure any of the flowers survived the trip here. Coldharbour is a dead place and Kyne is concerned with living things. If you found the flowers, maybe she hasn't abandoned us. I'll make the purifying potion now." "One more thing … there! That should do it!" 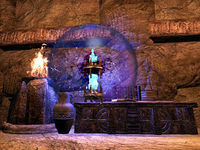 Nelhilda will then head over to hear makeshift alchemy table to start the mixing the potion. Nelhilda: "I hope I remember the recipe correctly. It's been so long since I've tried to do anything more complicated than downing a mug of mead in one gulp." Nelhilda: "One more thing … there! That should do it!" Nelhilda: "Take the potion and pour it into the the three casks. I … need … some mead!" Her cravings for the mead will overcome her and she will run downstairs. Purify the Casks of Special Blend. Before Nelhilda ran downstairs, she will hand you the Purifying Potion and tell you what to do. So follow her downstairs and look for the three large mead casks. As you pour the potion into each one, they will glow with a golden light. Once this is done head over to Bernt to see what else can be done, since Nelhilda will no longer recognize you. As you speak with Bernt he will blurt out that it was his fault that the curse happened. Long ago, his tavern was doing poorly and he was approached by a stranger who offered to help. He took the deal, unknowingly damning his village. "My Nelhilda would thank you if she could. Oh, this is all my fault! I was just trying to save my failing business. Now look at us. These people used to respect me. I used to help them." "I made a bargain, but I was tricked. I realized too late that the mage who promised to help me was likely a Daedric Prince! After that, the Flagon slipped into Coldharbour and we've been trapped here ever since." Your daughter is trying to end the enchantment. "It used to be me that people turned to for help. When Hautt showed promise, I bought him a lute. When Hridi won a contest, I gave her dueling daggers. Nelhilda has gotten things rolling with your help. I want to help her, help my friends." "Hautt and Hridi were admired in our village. If the enchantment is wearing off, they'll help me rally the others. It would help if Hautt had his lute and Hridi had her silver daggers. We can continue what Nelhilda has begun." As the purified mead does its work, Bernt hopes to inspire Hautt Silvertongue and Hridi Daggerhand so they can rally the other patrons. 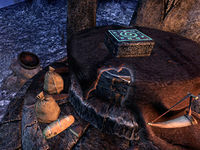 He has asked you to find Hautt's lute and Hridi's daggers, they will be hidden outside but you have the option of speaking with both of them for some clues to their location. Hautt can be found on the first floor, leaning against a wall. If you ask him about the lute he will want to have a competition first. "I used to sing for thanes and kings. I danced around and had many fine things. How about that! I made a rhyme. I've still got it!" Do you remember the last place you played your lute? "You're a curious one. I imagine the Thane is keeping his eye on you. You want me to reveal a secret? Secrets are a bard's trade, after all. There should be a price. I know! A contest! A duel of words. If you win, amazing secrets will be told!" You can either participate or if have the Intimidating Presence passive you can bypass it. [Intimidate] I don't have time for this. Just tell me where to find your lute. "Oh, you're angry! How positively adorable! When last I saw my beloved lute … I played a song for the lovely Juvilda. I struck a pose, inspired by the statue outside her house. And I sang my heart out, let me tell you. She was suitably impressed." If you decide or have to play along, you can agree to Hautt's competition. All right. What are the rules? "I say something witty and clever about you … and then you respond in kind. I'll start. Whither goes that guar? Did it escape from Vvardenfell or is it your sister?" "I last played it for Juvilda. I struck a heroic pose, like the statue of Ysgramor near her house." That guar was your wife. Speaking of retort, your armor is so old, even an Akaviri wouldn't wear it." This isn't my armor. It belongs to your wife. "Oh, well played! Well played! If I had my lute, I would sing of your prowess. It's gone, though. I last played it for Juvilda. I struck a heroic pose, like the statue of Ysgramor near her house. Sang my heart out. I used be quite good, you know." Or ignore the game and make him tell you. That guar needs your lute. "That makes no sense. Why would a guar need a lute? It has no fingers! Let us try again. Who cut your hair? A Falmer? Ha! Take that!" Don't you want your lute back? "Begone, you of sober face and dull wit! Making me think of my poor, lost lute. How depressing. I last played a song while wooing Juvilda. I struck a heroic pose, like the statue outside her house. Sang my heart out. She was suitably impressed." Both paths take the same amount of time and all mention the same place. The house you are looking for is to the northeast of the tavern and down the hill, however, it was a long time ago when he played that lute —so you will need to look for the ruins of statue. In one of the nearby houses will be a large urn which contains Hautt's Lute. Hridi can be found on the second floor near the stairs. "You look familiar. Were we flirting just a little while ago?" Bernt said you lost a set of dueling daggers. "I am a dangerness … dangerous … woman. Even without my silver daggers, I could flay you. If you think you can threaten me, drink again! I mean, think again! If you want my daggers, you'll have to duel me for them!" I just want to return your daggers. "I'm too duel to drunk. Did I ever tell you I once had a pair of silver dueling daggers? Given to me by … who gave them to me? I should remember. He was such a nice man. I was brave and fast with my knives. You should have seen me duel." Try to remember what happened to the daggers. "You'll find them? Aren't you sweet. Let me think. I remember the Thane said it was too dangerous to drink and duel. He said I should destroy them. But I couldn't do it. So I hid them, near the old mill. Please don't tell the Thane." The mill she speaks of is to the northeast of the tavern, near the outskirts of the village ruins. Leave the tavern and head over to it, dealing with the monsters as you go. Once you enter the mill, look for a trunk in the corner—this will contain the Silver Dueling Daggers. As the mill is in the same direction as the location of the lute, you can grab the latter on the way there or on the way back. Once you have both items, head back to Bernt. Thane Fellrig is revealed as an imposter. When you enter the tavern, you will find several of the patrons have surrounded Thane Fellrig and are yelling at him. Romord: "You knocked down an old man!" Solding: "I've had just about enough of this." Thane Fellrig: "I think everyone needs a drink. How about some more mead!" Romord: "We don't want any more mead! Get out of here!" Thane Fellrig: "Your souls are mine! You may as well drink up and accept your fate." Varhilda: "Shor's bones! We've been deceived!" Thane Fellrig: "I want to hear you beg or I'll cut off the supply of Special Blend!" Romord: "Where did he go? What just happened here?" After the Thane reveals himself to be a daedra of some sort, he will teleport away. Head upstairs to see how Bernt, he will be mostly unhurt and happy to see the patrons coming out of their enchanted mead haze. "Did you see? The villagers. They're starting to remember. The Thane threatened my daughter and I actually stood up to him. Of course, he knocked me down, but still. We're returning to our old selves!" I found the lute and the dueling daggers. "I'll return these to Hridi and Hautt. Ask them to help keep people's spirits up. During my confrontation with the Thane, he said he holds our souls. He laughed at me. Said how amusing it was to see me agonize over my friends as they waste away." Where would he keep your souls? "I think he keeps the souls nearby. He always comes and goes as he pleases. If you could destroy the Thane, our souls might return to us. Then we could leave this place. I think his lair is in one of the nice houses near the old well." I'll take care of the Thane. If I destroy it, that might release the souls of the villagers. To completely free the patrons from the curse, you will need to kill the Thane and somehow free their souls. Leave the tavern and head towards the houses to the needs direction, in one of them you will find a trapdoor—this is the entrance to to the Thane's Lair. Once you enter the trapdoor walk down the hallway until you come to a large chamber. 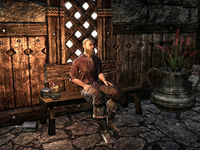 Thane Fellrig will be waiting for you at the other end and will appear to be guarding something sitting on the dais behind him. Thane Fellrig fights with a battleaxe and will rely on physical attacks at melee range. Thane Fellrig: "Ignorant blood sack! I'll have your skull as a drinking cup." Once Fellrig is dead, you can inspect the large blue crystal he was guarding. It will be the soul collector which has been siphoning the patrons' souls as they drink, until they turn into the soul-shriven which can be found outside. When you smash the crystal, eldritch screams can be heard and wisps of cyan light will leave the area and head elsewhere. Leave the lair and return to the tavern. Back in the Everfull Flagon, people will be already feeling the difference, Bernt will be on the second floor and you can tell him the good news. "I don't know what you did, but something changed! Everyone can feel it." I defeated the Thane and freed your souls. "Then the curse is broken at last." Shouldn't you tell the villagers what really happened? "They'll hate me if they find out I caused the curse. We've lost so much. I need to make amends, but what would the truth bring us except more pain? My Nelhilda mourns for her beloved Gamirth. I need to find a way to help her." Doesn't your daughter deserve the truth? "Maybe you're right. Nelhilda struggled to find the enchantment, and she lost her beloved Gamirth. She deserves my honesty. I hope she can forgive me." After convincing him to at least tell Nelhilda that he was responsible for the curse, he will call her over. Once she hears his confession, Nelhilda will understandably be angry. Bernt the Brittle: "Nelhilda, please come here." Nelhilda: "What is it, father?" Bernt the Brittle: "I need to get this off my chest. I made the deal that doomed us. I made the bargain with the Daedric Prince." Nelhilda: "Father! Why would you do such a thing? I lost my love to this cursed place because you weren't selling enough mead?" Nelhilda: "How can I ever forgive you for this? I never want to see you again!" Bernt the Brittle: "Nelhilda was the only thing that kept me sane in this dread place. What will I do now?" Bernt will follow her downstairs and you can too. Bernt the Brittle: "I beg of you, daughter. Try to forgive me. What I did was a foolish mistake. I never imagined anyone else would be at risk." Nelhilda: "I don't know what to do. I'm so angry at him … and yet … my father is all I have left." Speak with Nelhilda to see what she wants to do. "Look what my father's selfishness has cost us! How could he have been so foolish?" Do you think you can forgive your father? "That's asking a lot of me. My father always seemed more … aware. I sometimes wondered if he knew more than he let on. But to have caused all of this suffering? My poor Gamirth!" You can offer your input on how she should treat her father, which will decide his fate. You need to forgive Bernt. He's the only family you have left. "I know. I keep thinking about how kind he could be. Always helping others. He did something terribly foolish, but I know he is not a bad man. I'll try to forgive him. But I do wish we could leave this place." The Hollow City is safe. You should go there. "We will go to the Hollow City. Some of the villagers may decide to stay here, where it's familiar, but that will be their choice. I grieve for the lost, but it's not in a Nord's nature to just give up. Thank you for helping us." You will then receive some gold and the Everfull Girdle. Afterwards, she will then tell Bernt her decision and then will rally everyone else to prepare to leave for the Hollow City. Nelhilda: "I think I can forgive you, father, though it may take time. For now, it's best if we leave this place." Bernt the Brittle: "Oh, my dear girl. I will do everything in my power to make this up to you and to the others." Nelhilda: "Listen, everyone! We're going to the Hollow City! Join us! We're Nords and we can handle whatever Coldharbour throws our way!" Nelhilda: "Come, father. We need to make plans to travel to the Hollow City." Alternatively you can suggest he is left behind in the tavern as punishment. Bernt needs to be punished. He can remain here. "Yes, he can stay here in his precious tavern. Atone for his sins in solitude. I don't think I can ever forgive him. I keep thinking of Gamirth. That note you gave me broke my heart. I … I want to leave this place." Go to the Hollow City with anyone who wants to leave. You'll be safe there. "I'll lead any villagers that wish to join me to the Hollow City. A few may decide to remain here, where it's familiar, but that's up to them. I don't know if I'll ever forgive my father. He can remain here and help anyone who wanders in." You will then receive some gold and the Everfull Girdle. She will then tell Bernt her decision before rallying everyone else who is willing to leave for the Hollow City. Nelhilda: "I keep thinking of Gamirth and what happened to him. I don't think I can forgive you, father, but I'll try not to hate you." Bernt the Brittle: "No, Nelhilda, please! What will we do? What will we do?" Nelhilda: "Listen, everyone! I am going to the Hollow City. We will be safer there. It is time for most of us to leave this cursed tavern." Nelhilda: "You can stay here, father. In your precious tavern. Think about what your success has cost you and remember all that you have lost." After collecting the Kyne's Tear flowers, the runestone will be replaced with a different version — Runestone of Kyne. A skyshard can be found in one of the ruined houses, the one Among the vessel's burnt cousins. Three pages of Bernt's journal can be found which provide backstory for the original deal. If Bernt is forgiven, he can later be found in The Shining Star along with his daughter and some of the other former patrons. Nelhilda won't tell anyone else about Bernt's role in the curse. On the other hand, if Bernt is unforgiven he will remain in the tavern with some of the others that stayed behind. In this case, Nelhilda will tell the others about Bernt's Daedric deal. The body isn't a shriven or a Daedra. I should read the note and see what it has to say. I found a letter to someone who may be under an enchantment and trapped in the Everfull Flagon. I should find the tavern and see if anyone knows who the intended recipient might be. Something is definitely wrong at this tavern. I met a Nord named Bernt, who urged me to speak to his daughter, Nelhilda. It was her late husband who wrote the note. I should be able to find her somewhere upstairs. Nelhilda says the mead served here is enchanted. The patrons are trapped and their souls were stolen. She says she can disenchant the mead, but she needs a flower called Kyne's Tear. To find the flowers, I need to go to the abandoned shrine nearby. I found the abandoned shrine. Now I need to locate a runestone of Kyne. The sacred stone should reveal where the magical flowers grow. I found a runestone of Kyne. Now I should look for old trees where the invisible flowers may grow. Since I have the runestone, the flowers should reveal themselves to me. I found the flowers that Nelhilda asked for. I should head back to the tavern and give them to her. I should wait for Nelhilda to craft the purifying potion. When she finishes, I should take the potion. Before Nelhilda ran off to drink more mead, she told me to pour a portion of the purifying potion into the three casks of Special Blend. That should remove the dark enchantment that has corrupted the mead. I poured the purifying potion into the casks of mead as Nelhilda instructed. I should talk to Bernt and see if there's anything else I can do to help. Bernt confessed that all of this was the result of his bargain with a Daedric Prince. He thinks that Hautt and Hridi, who were once well-respected, could help him rally the others. He asked me to find Hautt's lute and Hridi's dueling daggers. I found Hridi's daggers and Hautt's lute. I should give them to Bernt so he can return them to their rightful owners. He thinks it will help restore self-respect and set a good example for the others. Inside the Flagon, the sobering villagers confronted the mysterious Thane, who revealed himself to be some sort of Daedra. I need to find Bernt and speak to him. Bernt asked me to deal with the Thane. He is convinced that the Thane keeps their souls in one of the ruined houses near the old well. I might as well start my search there. I need to kill the Thane of the Everfull Flagon so that I can free the souls of the trapped villagers. I found a trap door in one of the ruined houses. Maybe it leads to the Thane's lair. I defeated the Thane. I also found some sort of crystal stone that was clearly enspelled—perhaps it houses the stolen souls. If I destroy it, that might release the souls of the villagers. I freed the souls of the villagers. I should go back to the Flagon and find Bernt. I made it back to the Everfull Flagon. I should find Bernt and see what he plans to do next. Nelhilda was understandably upset when she realized that her father had caused the curse that plagued the Everfull Flagon and caused the loss of her husband. I should talk to her. Nelhilda decided to forgive her father. She will lead any villagers who wish to leave the Everfull Flagon to the Hollow City. Nelhilda won't forgive her father for the trouble he caused. She will lead any villagers who wish to join her to the Hollow City. But Bernt will remain here. This page was last modified on 2 February 2019, at 03:45.